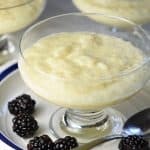 Homemade Tapioca Pudding is a simple, creamy, delicious, and timeless dessert. And easier to make than you might think! Place the water and tapioca pearls in a 1 1/2 quart pot. Let stand for 30 minutes until the pearls are plump and have absorbed the water. Turn on the heat to medium-high. Pour in the milk and salt; stir while bringing to a bare simmer. Reduce the heat to very low, add in the sugar and cook, uncovered, stirring frequently (so the tapioca doesn’t stick to the bottom of the pan), until the tapioca pearls have plumped and thickened, about 5 minutes. Take off the heat and cool for 15 minutes. Serve either warm or cold and enjoy! 1. Different brands of tapioca call for different instructions, so pay attention to the packaging - some small tapioca requires the pearls to soak overnight. If NO soaking is required, increase the amount of milk in this recipe to 3 cups. You might also need to cook the tapioca for longer than 5 minutes depending on the size of the pearls. 2. For a lighter, fluffier tapioca pudding, you can separate the eggs; use the egg yolks to stir in with the hot tapioca. Once it becomes thick, beat the egg whites in a separate bowl until soft peaks form. Remove the pudding from the stove and fold in the whipped egg whites.